Nami Island (Namiseom or Naminara) is a small ‘doraemon pocket lookalike‘ island situated 63 km from Seoul in the middle of the Han River. This charming Island is famous for the ‘Winter Sonata’ film locations back in 2002. Apparently, Nami Island declared its cultural independence on March 1, 2006. Like other independent republics, Naminara Republic has its own national flag, anthem, passport, postage stamps, telephone cards, written characters, papers, and currency. Do not fret, passport is not required to get to the island but admission fee applies. Watch snippets of my journey to Nami Island. The best and cheapest option is by rail. You may refer refer to the Real time rail map for your route. Click here for quick guide. Depending on your point of origin, I took the above route to reach Gapyeong station. From Chungmuru >> (Transfer to) Oksu >> (Transfer to) Sangbong >> Gapyeong. 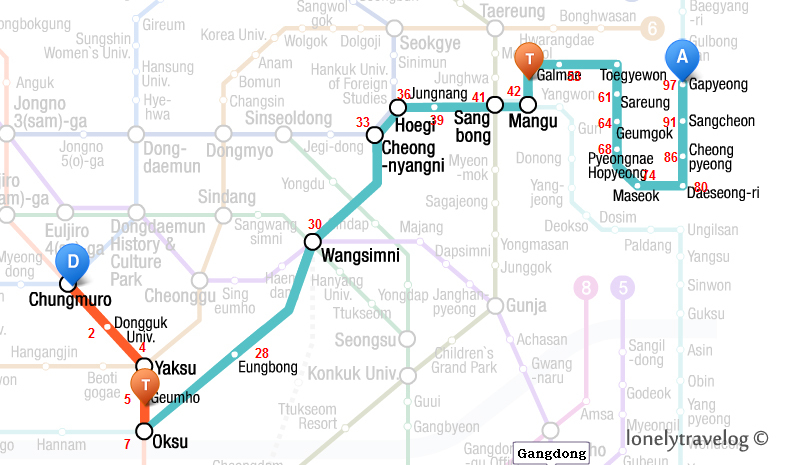 Do note that from Sangbong to Gapyeong, you are traveling on Gyeongchun Line, operated by KORAIL. You will noticed that Sangbong station or Gapyeong (Gyeongchun line) does not exist in your subway map because they operate individually. However, you only need to tap-in your T-Money card from the origin station (eg. Chungmuru) and tap-out at the exit (eg. Gapyeong). No additional ticket needed. The train ride cost me 1950KRW. While transferring at Sangbong to Gyeongchun Line, please take note of the line that you are heading to. In this case you are heading to Gapyeong. When I was there, apparently both track were heading to Gapyeong station. There was a bit of confusion but thanks to the local guy, he told me that both tracks were heading towards Gapyeong. From Gapyeong Station, I took the cab to Nami Wharf. The taxi stand is located outside the station. The cab driver understood well enough regarding the existence of Nami Island ferry terminal. This short cab ride will cost you less than 3000KRW per trip. KORAIL. The train look exactly like a normal subway train. Apparently Gyeongchun Line was operated recently in 2010. There are Shuttle buses departing from Insadong and Namdaemun (w.e.f 1 Jan 2015). Depart from Insadong (Tour bus stop near Tapgol park) at 9.30am. Returning to Insadong from Nami Island at 4.00pm. To do so, you need to book your ticket in advance OR be there as early as 9.00am to purchase your tickets, subject to availability. Round trip will cost 15000 won per adult. Depart from Namdaemun. Sungnyemun Square Bus Stop (In front of Namdaemun Market). 2 ways to get to Nami Island. The conventional way or adventurer way. For adventurers, you can take zip lining which you bring right to the Island! It cost 38,000KRW including admission visa. Fastest way to reach and you can enjoy the adrenaline rush. The conventional way is by ferry. Get your entry visa at the counter for 10,000 won for round-trip ferry fare & tax included in ticket price. After which, proceed to the wharf entrance to board the ferry. The Nami Maid will ferry you to the Nami Island. The weather was so cold that you can notice the blocks of ice floating on the river. The ferry ride will take about 5 mins. Upon reaching Nami Island wharf, notice the statue wearing red top right in the middle of the river. This is one of the famous landmark to look out for. Unfortunately, the river was covered with icy snow. Nami Island was named after General Nami, a notable figure in Korean history who courageously fought in battles but died at the age of 26. Activities you can do there at Unchi garden aka Un-chi(Unicef+Child). Sky Bicycle, playground are some of the activities you can do. The UNICEF train runs between the entrance of the island to the central station in the main square. 2000KRW per ride. Symbol of Nami Island, the imaginary nation. While walking I saw this couple standing in the middle of the frozen river! Shortly after, we’ve been chase out by the police official for safety reasons. Anyway, I don’t want to die because of hypothermia in case the layer of ice breaks. There are different apartment to stay at Nami Island. This is one of them called Dahlia. err.. I don’t need to elaborate on this. Inside the galley contain all the photos of the winter sonata drama in 2002. You can easily find a children story books! Even in the toilets cubicle. If you’re up for an adrenalin rush. There’s a Bungy jumping activity, a 55-meter jumping tower near the dock to Nami Island. Hi, may I know when was your travelling period where nami island was covered in snow ? Hi Louis. It was in early February. Am back to Malaysia on 18/5. Nami island best place for sightseeing & lot of activities especially I love cycling. Hi ,I cannt find the website which we can book the apartment called Dahlia. Do you have the email so we can book from them ? Is there anything to eat after 10pm if stay overthere ? Thanks for the compliments! Have fun planning! I just got ur replied by today & am come back from Seoul at 18/5 lol. It’s hard to communicate with Naminara hotel website I couldn’t understand I guess only always fully booked by local native. Anyway tks & we do have lots fun there. Pingback: Top 5 Travel Destination – Art . Intuition . Wow, great photos and so detailed. Thanks for the post! Will keep in mind when I am in South Korea. Does it get warmer there in spring/summer? Hi, I have a question. If i were to spend in Nami Island for a day, lets say i ended the journey at about 9pm local korea time at Petite France, will it be okay if we take a cab back to Gapyeon Station? Will it be expensive? I have a question. If I take the zip over then how do I come back? By ferry, any fix timing? Hi Jac. The zipwire package included a return ferry ride back. The ferry usually runs every 30mins to Gapyeong Wharf. hi,may i know,did outside nami island got taxi for going back to gapyeong station? 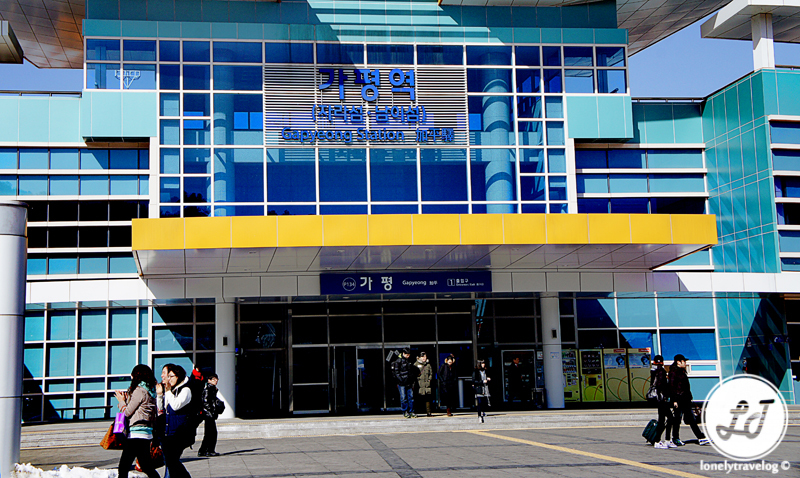 Yes, there is a taxi stand near the ferry terminal to Gapyeong Station. Can we buy entry visa in advance? Like a day before? You can purchase it when you arrived at the dock. Thank you for introducing me to Nami Island. Thanks for the heads up! Appreciate it much! Just saw this via your profile. Love the cute train! Thanks for the write-up. I really like this posting, but there are way too many pictures in this one post. It takes too long to load and then to scroll. Hi Pit. Thank you for your feedback. The reason why there are too many photos is because I want to share the scenic view of the Island to my readers. Then again, I apologise and point taken. Thanks for replying and explaining. And don’t apologize, please. I can understand that one wants to put as many pictures online in a blog. I’m constantly in the same dilemma, either to have looooooooooooong postings or a few pictures only of the many I want to post. My present compromise is to put two or three pictures in a blog-entry by themselves and add the others from the same area in a gallery. I think that helps. Maybe you’d want to check the way I did it here [http://pitsbilderbuch.wordpress.com/2013/06/16/deutschland-reise-fruhjahr-2011-19-rugen-kreidefelsen-und-kap-arkona/] and leave your comment. Unfortunately the text of that blog is (mainly) in German. Sorry about that. Hi it’s me again, I hope I am not troubling you. Just read The Lonely Planet and it mentioned that 19 – 21st Sept is a National Holiday in Seoul. As my planned trip will be around those dates how will that affect my trip? I planned to go to Sorak Mountain from 19 -20 Sept. Should I do my booking early, as I planned to spend a night at Sorak Mountain? This is my first visit to Seoul and I want to see as much as possible. Thank you. Hi Amy sorry for the late reply. You might anticipate crowd during the public holidays. If you’re staying a night at mount sorak, I would suggest you book your accommodation early to avoid disappointment. Hi thank you very much for the lovely photos on Nami Island. Will be visiting Korea in September 2013, and my daughter said Nami Island is a must. Never knew why but after seeing your photos I can understand why! What type of weather should I expect in middle of September? I am from Malaysia and our country is very hot. Hi Amy. Yes a lovely island indeed. September will be the starting of Autumn season.You can expect mild weather and a bit chilly in late sept. I’m sure you gonna enjoy Nami Island as much as I do. Hi, May I ask if first week of April would also be nice to visit the Nami Island? Certainly, it is the cherry blossom period. 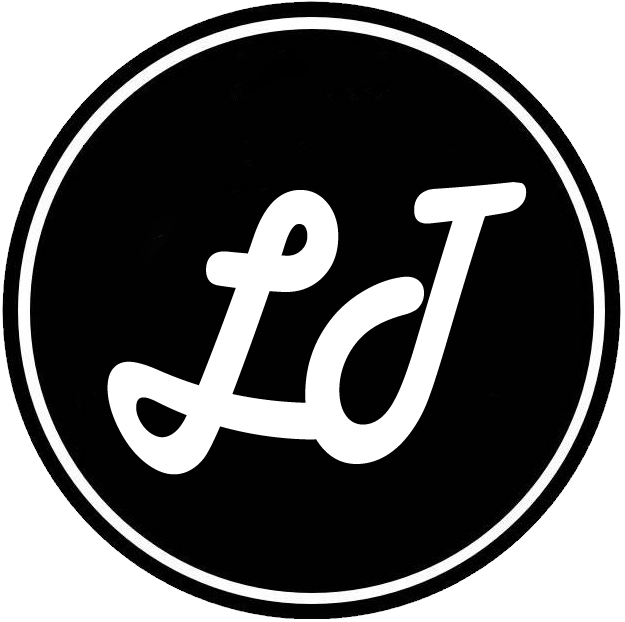 Thanks a lo bro….. lot of info… will visit on 18 or 19 Jan 2013….. do hope to see what you have seen…..
You’re welcome. Have fun! I’m sure you gonna enjoy as much as I do. Perhaps it’s further away from Seoul city. I can say that the island is worth a visit. Glad this article able to help with your planning. Love the photos. Brilliant! I must put this on my places to visit list. Thanks! This is one of the places that you have to visit like seriously! Very interesting place. Thanks, that must be the smallest nation in Asia. Great photos…. a place that I would like to visit someday. And thanks for the like on my blog. Lots of interesting information on this interesting island, thank you for sharing. Do you have any contact number or website of Dahlia apartment? Hey. Try http://www.namihotel.com/html/hotel_info.html I hope this helps but the language is in korean though. Such a rich culture. I am saddened by the monstrosity of gangsters that run North Korea. Thanks for visiting Mehmudah! See you around! Just returned with my wife and daughter (4 years) – it was fun but we only spent 90 minutes and it was enough. Yea. It’s a small island. Perhaps in winter nothing much you can do except photography and cycling. yeap! a nice place to visit actually.. Away from hustle and bustle of city life! i can so see that, pal. U should! I think autumn is a gd choice to visit. How’s ur visit to south east asia countries? It was awesome! So much good food… especially fruit and roti/prata. Mmm. Singapore is a lovely place! But of course there wasn’t enough time for everything – I’ll have to go back! Good to hear that! Kinda envy of u getting back to korea. Will be waiting for your write up on SEA trip! As always, thank you for introducing me to such an amazing city! I never knew that Korean couples wore the same inside layers and shoes! Fun! My son would never come out of public restrooms if there were books outside. He loves reading in the restroom! Welcome! Me too actually but i find that quite sweet wearing matchy2. Sad to say the storybooks are in korean language but interesting pictures tho. You really capture my heart to visit seoul eapecially nami island! Commendable job regarding your photos here including the other galleries. Keep up dude! Thanks Alwin. Appreciate what you share here. Will do!